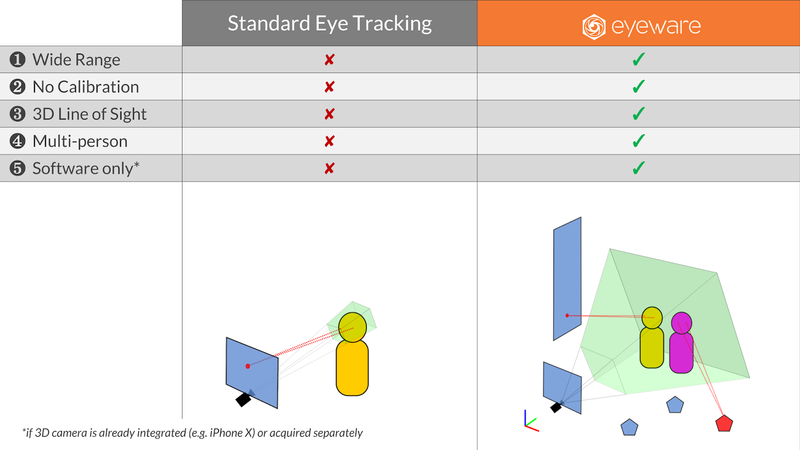 Swiss startup Eyeware develops 3D eye tracking software for depth sensing enabled consumer devices, such as Microsoft Kinect, Intel RealSense, Orbbec Astra, etc. How do they track gaze from low-resolution 3D images? "Generally speaking: We require a low-resolution 3D pixel cloud of the face and eye regions and are agnostic to the underlying technology. It works as well for ToF sensors (i.e. non-RGB images). Our software uses that input to model the head pose and eye regions, providing the gaze vector in real-time." Eyeware announces the closing of its seed financing round of 1.9M CHF ($1.9M USD). The seed round was led by High-Tech Gründerfonds (HTGF), in partnership with TRUMPF Venture GmbH, Swiss Startup Group, and Zurich Kantonalbank. Eyeware is a spin-off of Idiap Research Institute and EPFL created in September 2016. Eyeware software can use automotive grade ToF cameras to estimate attention of drivers for in-cabin monitoring and infotainment systems. The capital will be used by the Eyeware team to bring the 3D eye tracking development kit ready for integration into consumer applications.